Opera lovers don’t get a lot of second chances. The first time a performance of a particular work blows you away can never be repeated. A stereotypical opera lover’s fussiness regarding, encyclopedic knowledge of, and obsession with performers, productions, recordings and the various qualities thereof stem, I think, from that unslakeable thirst to repeat that sense of overwhelming consummation that the art forum delivers to its addicts. Even a casual fanatic such as me is spurred to become a completist. I have dug through libraries, musty stacks of vinyl at yard sales, and combed through online snippets to find something rare and beautiful, like a maddened musical lepidopterist. I own at least one decent copy of every opera written by Verdi, who is my absolute favorite. Though I certainly like some of his 37 works better than others, I am capable of listening to any of them an infinite number of times. They are classics, which according to my definition mean I can go to them and find something new and inspiring within them each and every time. Still, 25 years after I got hooked, I didn’t think I’d get that hot-wire hit of sonic bliss again – until, that is, I stumbled across this recording. 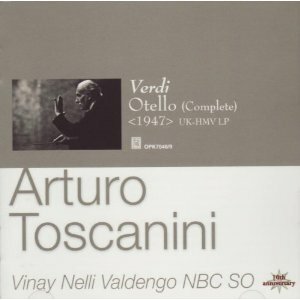 It’s a remastering by Japan’s Opus Kura of the edited 1947 live NBC broadcasts of Verdi’s “Otello,” conducted by Arturo Toscanini. Extraordinarily, I felt I was hearing an opera I knew backwards and forwards for the first time. 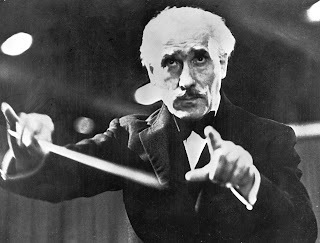 Additionally, Toscanini was the face of classical music to an entire American generation. NBC Radio president David Sarnoff developed the NBC Symphony Orchestra specifically as a tool for Toscanini, after he fled Fascist Italy in 1937. For the next 17 years, (save 1941-1944, when a contract dispute between the maestro and the network put Leopold Stokowski on the podium), nationwide broadcasts cemented Toscanini’s interpretations as the standard. Not to say that he was always right. He is acknowledged as a master of the Italian repertoire, having known and worked with Puccini, Catalini, Leoncavallo and Respighi – but composers such as Beethoven sometimes sound under his baton as they would had Beethoven only listened to Toscanini in the first place. The three factors that give this performance such immediacy and depth are its pacing, its clarity and its intensity – all of which go far beyond even my formerly considered high-water mark, the 1978 Domingo/Scotto/Milnes recording under the direction of James Levine. Toscanini’s unquestionable tempi are swift, so much so that you feel the maestro was concerned with catching the last train to Riverdale. It goes against the popular feeling that an opera’s pace should be leisurely to the point of voluptuousness. It reinforces my sense that, for all his genius, Verdi was a showman. He knew he had to grab the crowd and propel them through an evening’s entertainment, and he wasn’t above it. His acolyte Toscanini keeps things brisk, but without sacrificing depth or clarity. As to clarity, I have never heard each and every instrument to such a degree in an opera recording. This performance took place in NBC’s Studio 8H (where “Saturday Night Live” now holds sway), a notoriously “dry”-sounding auditorium built expressly for broadcast. Despite this limitation, the superb production and engineering lets all the details come through without a loss of balance. This remastering seems to have as its source Ward Marston’s excellent version, taken from a set of 16-inch aluminum discs that picked up the sound from two live broadcasts – Acts I and II on Dec. 6, 1947 and Acts III and IV on Dec. 13 of the same year. (Marston did interpolate three moments from rehearsals to cover for errors in the live broadcasts.) The next year, RCA switched to recording on high-fidelity magnetic tape, but it is hard to imagine a cleaner sound here. The intensity of the performances no doubt stems in part from the luster of working for Toscanini, as well as the natural bump in adrenalin that comes from a live performance. Toscanini chose his principals well. His Otello, Ramon Vinay, was just beginning to make that part his own. Herva Nelli, who plays Desdemona, was Toscanini’s preferred soprano. Giuseppe Valdengo, who later played Falstaff for Toscanini on NBC three years later, rises to the occasion as Iago, despite some lapses in the top end of his range. These three singers, not known for their expressiveness, are coached into a white-hot frenzy by the conductor. And, on a purely musical level, I feel that Toscanini imparted to his players and singers the sense that they were not a herd of subordinates but a collection of voices -- voices that had to be heard. Each moment of the score, every note had to be enunciated fully and completely in order for Verdi's scheme to become real. And that sense of the imperative flowed into the players and gave their playing a distinctive dimension. The stakes could not be higher. To me, Verdi is opera’s Shakespeare, and it’s only fitting that he wound up his career with two adaptations of the Bard’s work. With Toscanini’s aid, Verdi gives us a definite operatic version of “Othello” and creates a unique work in and of itself. I wonder if there are more gems out there like this, waiting to make familiar loves fresh again.